This site is designed to get you up to speed fast with the necessary equipment for Kite Aerial Photography. Brooxes.com changed ownership in January 2013, but the product line has stayed essentially the same. Ken Conrad of Great Winds Kites in Seattle is the new owner, but some of Brooks Leffler's pages have been held over to provide context and background. Kite Aerial Photography (KAP) has been around since the 1880s, and experienced a renaissance a hundred years later. 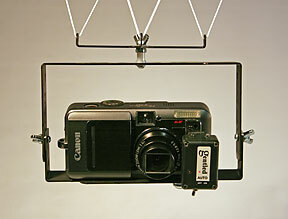 Camera cradles were all hand-built, one-of-a-kind devices until Brooks Leffler started making do-it-yourself kits in the late 1990s. In 1999, Ken Conrad asked Brooks to run a KAP workshop at the Fort Worden Kitemakers' Conference in Washington State, and the first do-it-yourself kit was born. So it is fitting that Ken should take over this site upon Brooks' retirement. After making over 100 custom rigs and another 100 kits by hand, Brooks engaged a professional metal fabricator in 2003. The first kit led to several other models, and altogether, more than 3,200 KAPers worldwide have built and used brooxes kits. 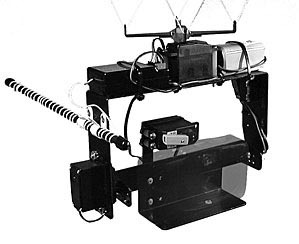 On our KAP KITS page, you'll find an assortment of aerial camera cradles in do-it-yourself kit form, from simple frames to elaborate radio-controlled systems. Our bare-bones Simplex Kit can be assembled in less than an hour. If you choose the fully-accessorized Deluxe Kit, you can finish a ready-to-fly radio-controlled rig in four to six hours, using basic hand tools and an electric drill. 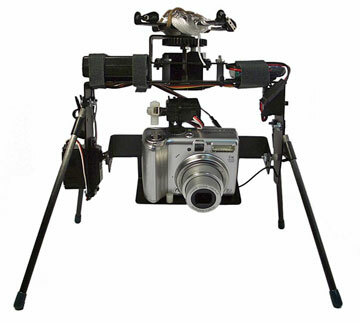 If you'd prefer to design a camera cradle for yourself, many of the necessary components are available in our PARTS DEPARTMENT for you to incorporate in your plans. Or you may find inspiration and ideas on the EQUIPMENT pages, where you’ll see pictures of cradles that Brooks has built for himself and others. To carry your rig, we sell a range of kites, from powerful workhorses to low-wind lifters, along with tails, line, and winders, on the KITESTUFF page. On the DOWNLOADS page, you will find printed instructions and diagrams on a variety of KAP subjects, published in Adobe Acrobat format, which you may download for yourself. You will need the Adobe Reader, which you can get free from Adobe if you don’t have it already. This is a Flickr badge showing public items from the Kite Aerial Photography (KAP) group pool. Make your own badge here. The best place to see KAP IMAGES is on the photo exchange site FLICKR, where you can browse through 25,000 pictures by over 2,000 KAPers from all around the world. On the PANORAMAS pages, you'll find a selection of Virtual Reality scenes taken by Brooks that put you in the middle and allow you to see 360° by controlling the view with the mouse. 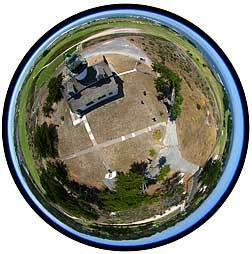 A sampling of ground-based panoramas is included along with a selection of aerial panoramas.